Earlier this month I received an email from Lyanna of Purple Panda Quilts asking if I wanted to be involved very special stocking drive. Lyanna is a quilter and a blogger, but in "real life" she works with the Bair Foundation and every Christmas they provide stockings for foster children. Normally the kids get construction paper and yarn stockings that are thrown out after being used. As I was reading her email, I think this was the point where my heart broke a little bit. I guess I just took for granted the fact that every year when I was growing up, I had the same stocking (that my mom made for me). In fact, I still use it when I am at my parents house during the holidays. 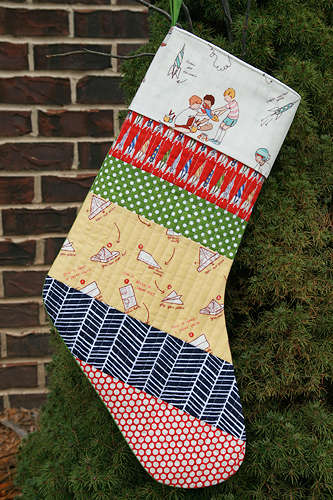 So of course, I didn't hesitate in saying I would love to make a stocking and blog about the stocking drive. 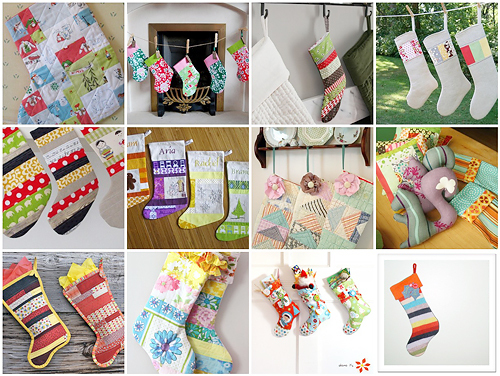 Stockings for Kids is Lyanna's effort to gather 50 handmade stockings before December 1st. You can see more information on her blog and in the Flickr group. There is a blog hop going on where you can find tutorials on how to make stockings or add different features, like the cuff on the top. (I followed that one, it was great!) There are even prizes! For my stocking, I didn't use a pattern but simply took one of our stockings and traced it with a 1/4" extra on each side to take into account the seam allowance. 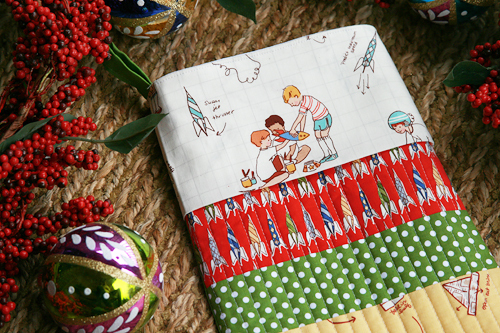 I pieced strips of Sarah Jane Studio's Children at Play fabric and threw in a bit of Joel Dewberry's Modern Meadow and some red Kei Honeycomb. 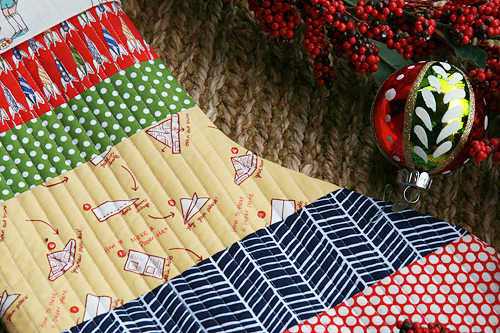 The front of the stocking is like a quilt. It has a back, batting and the pieced front. I quilted it with straight lines about 1/2" apart. The back of the stocking is a solid green. Then I followed Allison's tutorial on assembly with a cuff and lining. The cuff fabric is also from the Children at Play line. Easy peasy! I put together a little collage of inspiration from Flickr. I hope you will consider making a stocking for these kids, it is such a great cause!